2013 AK Bend mdl. AHS 20/08 82 ½” 4-Roll CNC Plate Roll s/n SY210-112 w/ ESA CNC Controls, 8” Top Roll, 7” Bottom Rolls, 6 ½” 4th Roll, Roll Support Cage. 2013 Bendmak mdl. CY4R-HS 20/10 80” 4-Roll Power Plate Roll s/n CY4RHS004 w/ Bendmak Controls, 9” Upper and Lower Rolls, 7 ½” 4th Roll. Bertsch 26’-2” 1” Cap. Hydraulic Plate Roll s/n M-10375 w/ 12” Lower Rolls, 7” Upper Rolls, Overhead Top Roll Anti-Deflection. Rollshear Type ASY-2H 10’ x 1” Cap Plate Roll s/n 70297 w/ 16” Rolls. Kumla / Backteman mdl. PV7H 118” x 1” Cap Hydraulic Plate Roll s/n 1895. Bertsch mdl.M-10759 6’ x 1” Cap 4-Roll Hydraulic Plate Roll s/n 082605 w/ Bertsch Controls, 12” Rolls. 6’ Power Conical Plate Roll / Cone Roll w/ 6” Rolls. Farnham 18’ Power Aircraft Roller Machine s/n 3-44-24 w/ 1” Rolls. Scottish Machine Tool / Craig and Donald No. 854 6” x 6” x 1” Angle Roll w/ 24” Rolls. Coda 24” Power Lamination Roll w/ 3” Rolls. Tennant Steel 400 Ton Horizontal Hydraulic Wheel Press. Niagara A50 / D-3 ½-15 88 Ton Hydraulic Gap Frame Stamping Press s/n 30389 w/ 8” Stroke, 40 Strokes/Min, 16 ½” Shut Height, 24” Daylight. Whitney mdl. 770-015 70 Ton Hole Flange Punch s/n 770-015-41 w/ Hydraulic Unit and Cart. Niagara AF-4S 60 Ton OBI Stamping Press s/n 43514 w/ 33” x 34” Bolster Area. Denison “HydrOILic Multipress” mdl.NA50C92D13A112 50 Ton Hydraulic C-Frame Press w/ 31 ½” x 20 ½” Bolster, 4” Cylinder Ram. Tox Pressotechnik mdl. S50.30.150.10.50 50 Ton Air-Over-Hydraulic C-Frame Stamping Press s/n 156040.10. YMGP mdl. 55A OBI Stamping Press s/n 700014 w/ Pneumatic Clutch, 18” x 29”Bolster Area. Nugier mdl. C50 14MWD10 50 Ton Hydraulic C-Frame Press s/n 1765. Hidaka MARK-45 45 Ton Stamping Press s/n 113 w/ 120mm (4.72”) Stroke, 50-96 Strokes/Min, 60mm (2.36”) Slide Adj., 810mm (31 ¾”) x 400mm (15 ¾”) Bolster. Diebel 40 Ton Straight Side Stamping Press s/n 56TF w/ 19” x 23” Bolster Area, 8”Mechanical Feeder. Minster No. 5 Type 5-OBI-FW 45 Ton Flywheel Type OBI Stamping Press s/n 5-16040 w/ 2” Stroke, 90-180 Strokes/Min, 2.75” Ram Adj., 28” x 18” Bolster. Rousselle No. 4F 40 Ton OBI Stamping Press s/n 18945 w/ Pneumatic Clutch, 3” Stroke, 105 Strokes/Min, 3 ½” Ram Adj., 12” Shut Height, 30” x 18” Bolster. Denison Multipress mdl. FL35-30HC592EH107R5616 35 Ton Hydraulic C-Frame Press s/n 25405 w/ 31” x 20” Bolster. Rousselle No. 3F 25 Ton OBI Stamping Press s/n 20202 w/ 3” Stroke, 135 Strokes/Min, 2” Ram Adj., 9 ¾” Shut Height, 21 ¾” x 15 ¾” Bolster. Nugier mdl. C-25 25 Ton Vertical Hydraulic C-Frame Press s/n 1182001 w/ 24” x 15” Table. Elms Engineering Hydraulic C-Frame Press w/ 24” x 96” Table, 17” x 19” Ram Area, 13” Hydraulic Cylinder. Denison Multipress 12 Ton Hydraulic Gap Frame Press s/n 21714 w/ 22” x 18” Bolster, 4” Cylinder Ram. Dennison Multipress mdl. WS1215MC304FS1 12 Ton C-Frame Hydraulic Press s/n 27105 w/ 8” Stroke, 21” x 13 ½” Bolster. W.A. Whitney mdl. 771-012 Hydraulic C-Frame Web Punch w/ 8” Throat, Hydraulic Power Unit. M & N 75 Ton 4-Post Hydraulic Molding Press s/n 0656 w/ 36” x 40” Heated Platens, 14” Stroke, 25 ¾” x 41” Between Posts. Michigan Roll Form Hydraulic Press s/n C0250-138. Klass / Emco mdl. 1-W-A 2 Ton Bench Model Punch w/ 2” Stroke 8 ½” x 6” Bolster. Denison Multipress 2 Ton Bench Model Press. Denison Multipress mdl. A 1 Ton Bench Model Press. USM United Shoe Machinery mdl. A Hytronic Cutting Machine – Clicker Press s/n 3979. D & H 50,000 Lb Cap Hydraulic Coil Car. Minster mdl. 1020-SCB 10,000 Lb Cap Power Coiler s/n 1370016 w/ 60” Max OD, 16”-20” ID. Littell mdl. H-80 “Lazy Susan” 8000 Lb Cap Uncoiler w/ 54” Max OD, 10”-20” ID, 40” Stack Height, 0-35 Turntable RPM. American 24” x 4000 Uncoiler. Pacific 500R14 14’ x ½” Cap Hydraulic Shear s/n S10792 w/ Controlled Back Gaging. Pexto mdl. 14-U-10 10’ x 14GA Power Shear s/n 6007. Famco mdl. 1472 72” x 14GA Power Shear s/n S-05905667. Cidan AS mdl. MS-F13/3 51” x 14GA Power Shear s/n 0330. National mdl. N5216-3 52” x 16GA Hydraulic Power Shear s/n 5216-3. Ewert & Kutscheid 8’ x 20GA Kick Shear w/ Back Gage. Davi-Ystad mdl. KMED 100”Cap. CNC Hydraulic Bidirectional Folding Machine s/n C40 w/ Ystad E1070 CNC Controls, 100” x 10GA Cap. Cincinnati mdl. 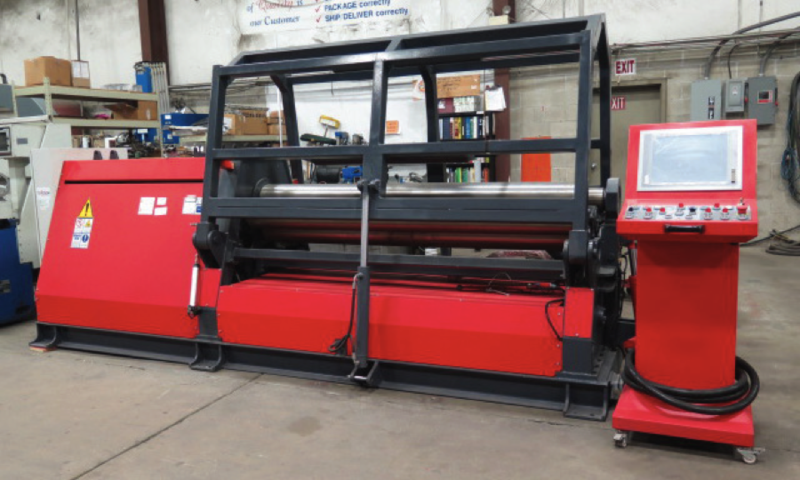 135AFX10 135 Ton x 10’ CNC Press Brake s/n 45588 w/ Cincinnati Autoform CNC Controlled Backgage, 10’ Bed, 8” Stroke, 7 ¼” Throat. Niagara 8’ Press Brake w/ Manual Back Gage, 8” Throat, 78” Between Uprights. Excelsior mdl. 60-12 12’ x 16GA Press Brake s/n 5257D w/ Manual Back Gage, 3” Stroke, 3” Ram Adj. Chicago mdl. 131 11 Ton x 48” Press Brake s/n 2400-005011 w/ 12” x 52” Punch Bolster. Steel Master mdl. ST-16S 165 Ton Ironworker s/n 6803 w/ Bar Shear 2” Round, 1 ¾” Square, Punch 1 3/16” Thru ¾”, 6” x 6” Angle Shear, 2” x 3” Notcher, Coping Notcher Attachment. Swade-Sir 1 ½” Cap Hydraulic Universal Draw Tube Bender w/ Bending Dies. Swade-Sir 1 ½” Cap Hydraulic Compression Type Tube Bender w/ Bending Dies. 1997 Koike Aronson mdl. DM510 CNC Plasma Cutting Machine s/n DM34097 w/ Koike Hybrid-D11 Controls, Thermal Dynamics PakMaster 75XL Plus Plasma Power Source, 5’ x 10’ Table. 1995 Mitsubishi CX20 CNC Wire EDM Machine s/n 55Y20450 w/ Mitsubishi Controls, 29 ¼” x 23 ¼” Base Area, 20 ½” x 14 ¾” Work Area, Dielectric Coolant and Filtration System. Sodick A5C Die Sinker EDM Machine w/ Sodick MARK V Controls, Travels X=18”, Y=15”, Z=12”, Filtration Unit. EZ-Spark mdl. 50P Die Sinker EDM Machine w/ EZ-Spark Controls, 11 ¾” x 23 ½” Table. Summit mdl. SC560X80 22” x 80” CNC Gap Bed Lathe s/n 97003 w/ Fagor CNC Controls, Tailstock, Steady and Follow Rests, 12” 3-Jaw Chuck, Coolant. Falcon Chevalier mdl. FCL-1840A CNC Lathe s/n X1864001 w/ Anilam 1200T Controls, Tailstock, 8” 3-Jaw Chuck, Coolant. Summit mdl. 26-4X10 26” x 120” Geared Head Gap Bed Lathe s/n 800422 w/ 14-1010 RPM, 4” Thru Spindle Bore, Taper Attachment, Inch/mm Threading, Tailstock, Steady and Follow Rests. Toolmex mdl. TUR630M 25” x 96” Geared Head Lathe s/n 50593-1995 w/ 35.5-1400 RPM, 4” Thru Spindle Bore, Inch/mm Threading, Tailstock, 15 ¾” 3-Jaw Chuck, Coolant. Giddings & Lewis Type 350 Horizontal Boring Mill s/n 5230 w/ 25-1500 RPM, 5” Spindle, 48” x 86” Table, Arbor Tailstock. Cincinnati No. 5 Vertical Mill s/n 3J5V1Z-13 w/ 14-1400 RPM, Box Ways, 20” x 94” Table. Cincinnati No. 307-12 Universal Mill s/n 2J23U5R-2 w/ 25-1500 RPM, 50 Taper Vertical and Horizontal Spindles, 12” x 60” Table. Van Norman mdl. 22L Universal Mill s/n 7444 w/ Colleted Spindle, 10” x 45” Table. Gorton mdl. PI-2 Pantograph Machine. CNC Enhancements “Autobar 400” Automatic Bar Loader / Feeder. Barnes Drill Co. mdl. 3010-65 10’ Automatic Vertical Hone s/n ND-11024 w/ Gemco 2500 Series PLS Controls, 40” x 30” Table. LeBlond mdl. 44PG CNC Jig Grinder s/n 21182 w/ Allen Bradley 8400MP Controls, 22” x 44” Table. Boyar Schultz Challenger H612 6” x 12” Surface Grinder s/n 25448 w/ Walker Fine-Line Electromagnetic Chuck. Imperia No.5 mdl. M6AR Tool and Cutter Grinder. Sunnen mdl. MBB-1660 Precision Honing Machine s/n 84517. W.F. Wells mdl. B-25-II 26” x 36” Horizontal Beam Saw s/n A-1875B84248. Dake / MEP Tiger350AX Automatic Miter Cold Saw s/n 006026 w/ TigerAX Controls, 4-Speeds, 15-90 RPM, Power Feeds. HEM Saw Series 15A mdl. 15A8 16” Automatic Horizontal Band Saw s/n F151935PC-W.
Hyd-Mech / MEP mdl. DM10 10” Miter Horizontal Band Saw w/ 60 Degree Left Tilt and 45 Degree Right Tilt. Marathon 10” Miter Cold Saw w/ 2-Speeds, Coolant. DoAll Z26 Zepher 26” Vertical Band Saw s/n Z4708226. Lockformer mdl. 24S 24” Vertical Band Saw w/ 20” x 22” Table. Kalamazoo mdl. AH9AWV 9” Automatic Horizontal Band Saw s/n 16446 w/ Auto Feeds, Conveyor. Startrite mdl. H225W 10” Horizontal Band Saw s/n 108823. Dake Johnson mdl. JH10 10” Horizontal Band Saw. Kalamazoo 9” Horizontal Band Saw. Kalamazoo mdl. K12SS 12” Abrasive Cutoff Saw. Delta 24” Scroll Saw w/ Stand. Fosdick 18” Column x 60” Radial Arm Drill w/ 14-1010 RPM, Power Column and Feeds. Mazak “Hole Master 6-16” 15” Column x 56” Radial Arm Drill s/n 77076R w/ 30-1800 RPM, Power Column and Feeds, Tooling Fixture Block. Carlton 13” Column x 60” Radial Arm Drill w/ 10-1000 RPM, Power Column and Feeds. Cincinnati Bickford “Super Service Radial” mdl 3E 12” Column x 48” Radial Arm Drill s/n 3E-488 w/ 14-893 RPM, Power Column and Feeds, Fixture Riser Block. Burgmaster mdl. 2BR Large Capacity 6-Station Turret Drilling/Tapping Machine s/n 21927. G & L Bickford Deep Hole Drill Press w/ 18” x 25” Table. Rockwell / Delta mdl. 17-600 Variable Speed Pedestal Drill Press w/ 350-4250 RPM. Finn-Power mdl. NC201S Hydraulic Crimper / Swaging Machine. Shape-It mdl.EW-52 52” Custom English Wheel w/ 52” Throat, Roll Anvils. Harpers “Pipe Maker” Flexible Tube Former s/n 7821 w/ 4”-18” Dies. D30” x 15” Cap. Drying Tunnel w/ Blowers. Wyssbord Type 125 IIA Gear Cutting Machine. Cammann Metal Disintegrator w/ 18” x 20” Table. Rothenberger “Collins 22A” Power Pipe Threader. Action Hydraulics 20Hp Hydraulic Unit s/n 3100-001 w/ Vickers 2600 PSI Integrated Pump. Collins Microflat 48” x 60” x 10” 4-Ledge Granite Surface Plate w/ Stand. Impulse mdl. AIE-605-FDV 24” Foot Operated Impulse Bar Sealer s/n 060335. Press Brake Dies, Electric Hoists, Electric Motors and Baldor Motor Drive Controllers. Lors mdl.1100AP 100kVA x 18” Spot Welder s/n 9802704 w/ Entron Welding Controller. Janda mdl. R30-12 30kVA x 17” Spot Welder s/n R2541 w/ Janda 3BH-4 Weld Controller. Alphil mdl. RFTG 30kVA x 13” Spot Welder s/n 7399 w/ Meteor Weld Timer. Toccotron msl. 2EG153 15kW Induction Heating Unit w/ Raytek PLC Controls. C-F Cullen-Friestedt mdl. 200 20,000 Lb Cap Power Welding Positioner s/n 124 w/ 54” x 55” Table. Hercules Low Level Hydraulic Dumper.